One of the most important things to do in preparation for hunting season is to make sure you do proper gun maintenance. Most people think cleaning a gun is running something down the barrel and when the barrel is clean they call it a day. Not exactly true. D stands for Disassemble We take apart every screw and every piece that comes off the gun. We don’t just take the entire trigger group out and drop it in a sonic cleaner and blow it out. We will take the entire trigger group apart. C Stands for Clean. 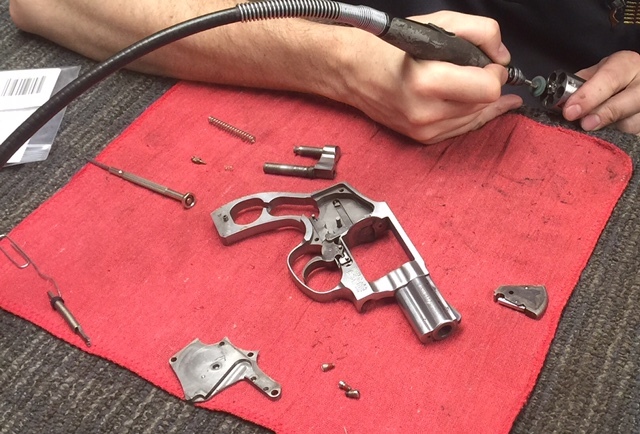 After the gun is completely apart we will clean and inspect each part one by one. We will look for stress or look to see if there are going to be any future problems. You don’t want to have your gun cleaned and then find out you should have replaced a $5 part when you are on your hunting trip. We clean the parts by hand in a parts washer or we can put individual parts in our sonic cleaner. O stands for Oil. We will properly lubricate each part with the correct type of oil that each part needs. A stands for Assemble. We will properly put your firearm back together function test it and test fire it here are our shop. We clean all firearms to a very high standard as if those guns were are own. If you clean shotguns properly before the season starts you can eliminate 90% of future problems you might have. We will replace rings that cost $5 a lot of times so they don’t fail in the field. I would rather replace a $5 ring than ruin a morning hunting trip.